Printing in color has become relatively inexpensive, but all color printers are not the same. Here we’ve surveyed four distinct printer models ranging from a low-cost model offering advancements for its price range to high-end machines appropriate for networked printing. The Epson Stylus C80 printer offers a breakthrough in ink technology. The new DuraBrite Ink, in four individual cartridges (cyan, magenta, yellow, and black), is a pigment ink, rather than traditional dye ink. The pigment ink rests on top of the paper without bleeding or fading. Durable and water resistant, it is ideal for wet lab use or for printing documents that might be used outdoors. Individual cartridges mean that users need replace only the one that runs low, rather than throw out an entire color cartridge when one color is depleted. The cost of the three separate color cartridges is comparable to one three-color cartridge. 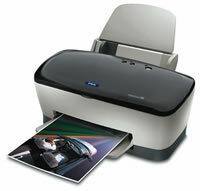 Most printers use a process called xerography, which involves exposing an electrically charged photoconductor to light. The light causes the charged particles to dissipate, creating the image that will be printed. Toner, tiny particles of plastic dust, is attracted to the charged areas of the photoconductor, and then transferred to paper by heat fusion. The printing process occurs using one of three technologies. 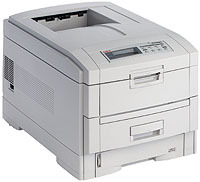 Laser printers rely on a laser beam to bounce light off of a rotating mirror onto the photoconductor. LED printers use semiconductor technology rather than lasers, complex lenses, and mirrors. Fewer moving parts mean fewer mechanical breakdowns. Solid ink printing, a proprietary technology available only in some Xerox printers, uses specialized ink that remains solid until melted by the heat of the printing process. Unlike water-based inks used in many inkjet printers, solid ink is durable, water-fast, and vibrant. Most printers use four colors to print any color document, though some photo enthusiast models use six. The ink is stored in cartridges and called forth as needed. Usually, color is applied in a four-pass process: The photoconductor g'es through four successive printing cycles to transfer the desired amount of color, one at a time, to the page. For this reason, color printing operates four times slower than monochrome (black) printing. However, recently developed single-pass technology relies on four photoconductors (as well as four lasers or LED imaging systems) to simultaneously print all four colors, dramatically improving printing speed. While these printers are more expensive than four-pass printers, the price difference is shrinking.